One of the most important things to consider when shopping for a salon shampoo is hair type. Common hair types include fine, coarse, dry and damaged and color-treated hair. Once hair type is determined, focus on hair concerns, such as smoothing frizz, boosting body or protecting hair color from UV damage. It's also smart to read the ingredients on the bottle to determine which ingredients are beneficial for certain hair types. To keep color in tact, a sulfate-free shampoo is a good choice because prevents the fading of hair color. For fine hair, look for panthenol because it swells the hair shaft. Dry and damaged hair benefit from nourishing ingredients such as shea butter, avocado and grape seed oil. There are many different salon shampoo brands available and it can be overwhelming to narrow down the right one. Salon shampoos are also much more expensive than drugstore formulas. While a drugstore shampoo typically retails for less than $10, salon shampoos usually cost anywhere from $10 to upwards of $39. Salon shampoos are only guaranteed to work to the best of their ability when purchased at a salon. Some drugstores carry salon brand shampoo, which is referred to as "diversion." Diversion occurs when salon shampoo distributors may sell to a third party. These third-party distributors sell the product to an unauthorized retail chain, such as a drugstore. The manufacturer will not guarantee the quality and efficacy of the product unless it has been purchased at an authorized salon location. Salon brand shampoo costs vary greatly. Typical price ranges for salon shampoos are $9.50 to $39, as of October 2013. Certain brands that use high-quality, exclusive ingredients, such as caviar, or feature new technology, such as nanotechnology, can cost $30 to $50. 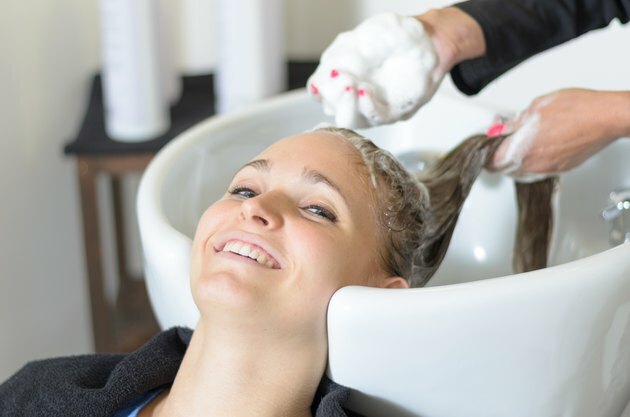 Certain discount websites will feature salon shampoo brands for much less than their retail price, but it is always best to purchase from an authorized salon. Salons usually carry sample size bottles of their most popular shampoo brands. At your next appointment, ask your stylist for a few different shampoo samples, so you can try them out without having to purchase the full-size version.